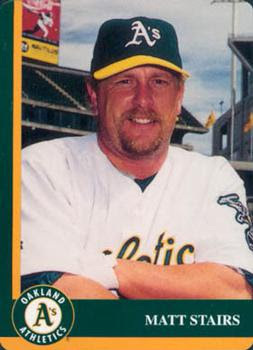 Happy 45th birthday to the much-traveled Matt Stairs, native of New Brunswick, Canada and one of a handful of guys to suit up for at least a dozen MLB teams (13 in all), his career nicely bookended by Montreal in 1992 and Washington in 2011, two versions of the same franchise. By coincidence, they're also the only two teams he didn't homer for (career stats). Matt's longest turn with any one team came in Oakland (1996-2000) and that's how I remember him as a fan. Stairs holds the record for most pinch-homers (23), breaking the mark of 20 held by similarly well-traveled slugger Cliff Johnson (career stats) in 2010. He hit 11 of those pinch-homers from 2008 to 2010, becoming a sort of late-game, anti-relief specialist. Oakland-based Mother's Cookies first made baseball sets in the pre-expansion 1950s and featured Pacific Coast League teams (1952 set profile). They returned after a 30-year absence with MLB team sets in the 1980s and were one of many to capitalize on the late-80s Bash Brothers' success (full set list). I still own several 1980s Mariners team sets, giveaways from Seattle's annual "Baseball Card Day." Unfortunately, this 1998 issue marked their last baseball year and financial problems (and accounting shenanigans) shuttered the original company in 2008 (SF Gate story). Kellogg's now produces the Mother's Cookies brand, but hasn't revived the card tie-ins. 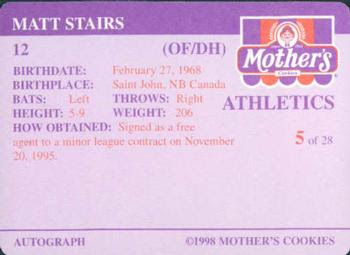 Value: Mother's Cookies singles from the 80s and 90s rarely cost over $1. Team sets depend on that year's stars and 1998 Oakland can be had for $10 on eBay. Fakes / reprints: Mark McGwire and Jose Canseco were both targets for fakes at the height of their popularity, but I haven't seen any counterfeit Mother's Cookies in the marketplace.